Top 5 Best Android Car Stereos – When it comes to cars, whether we are discussing the general maintenance and upkeep of them or all of the extra add-ons that can come with them, it can become incredibly overwhelming, especially if you aren’t aware of the things that you need or are looking for. The add-ons, alone, can seem endless- from air fresheners to tinted windows to sound systems- the list can most certainly go on and on. There is one luxury component of a car that many put much value into (especially if they take joy in road trips) and this one component is, you guessed it, the stereo system. It goes without saying that there are numerous stereo systems available on the market to those who are looking, which can be a double-edged sword, depending on your knowledge of stereo systems and be determining what will fit the needs of both your vehicle and yourself, the best. To help those who may be a bit concerned with all of the options that are out there, we here at ReviewCart let us help you by reviewing the top 5 Android Car Stereos for this year; and no need to panic for those who get nervous at “Android” when you are Apple users. Most, if not all, of the stereo systems mentioned below, are compatible with both Android and IOS software. If one were to want to use the AppleCar Play that may require a couple of adjustments to the stereo system, but nothing serious. 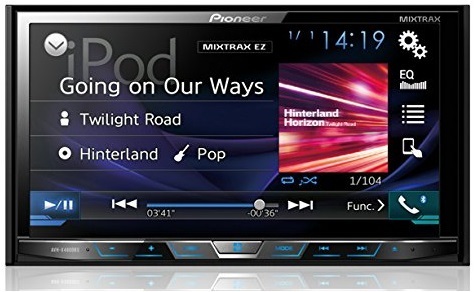 The Pioneer AVIC-8200NEX comes with a dual CD/DVD receiver that includes 6.2” touch screen and FM tuner; it also has 4-inch tall dash openings and provides a map of not only the United States but Canada and Puerto Rico as well. It approximately weighs 5 pounds, with dimensions of 11 X 6.5 X 10 inches; as we mention below, it also has the capability of being compatible with Siri (only on Apply software), which will allow for hands-free control as the long as your IOS system is for the 4S or newer. 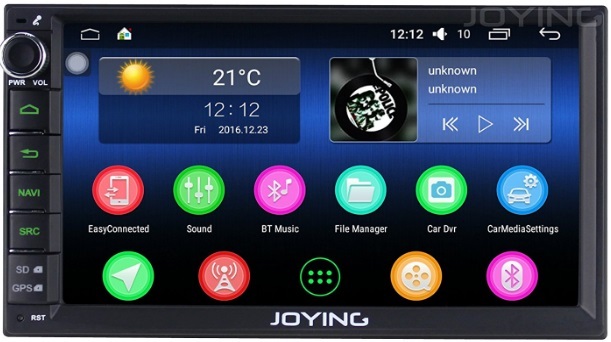 The Pioneer AVIC has a major proof being dual compatible- meaning, it offers compatibility with Android (auto) as well as Apple (for car play); you can easily toggle between both the Android and Apply software on the stereo’s impressive touchscreen display. The installation of the Pioneer AVIC is not bad at all; although you will want to make sure that you set aside enough time to get it taken care of, as it can take a bit longer, depending on your skill. An immediate con of this system is the price, which is, as of now, coming in at $699.00 (for brand new systems) on Amazon (there may be slightly cheaper options if you happen to find a used system). In addition to this, the AppleCar Play only works if it is plugged into USB Port 1 (USB Port 2 is for charging only); this is not a huge con by any means, but it is something that users will need to remember during install. 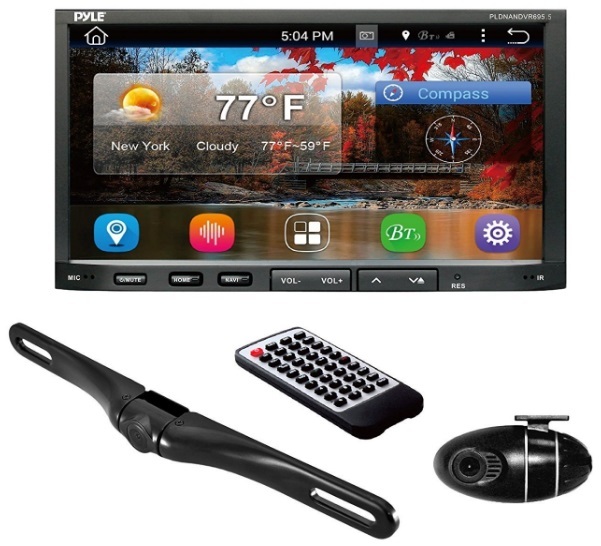 This Android stereo system comes with a 6.0 Quad Core system that offers a 1024 X 600 HD retractable touchscreen. Additional features of this particular stereo system include support for both iPhone/iPod audio inputs by USB, as well as mirror link for iPhone and Android Smartphone (which, depending on your needs, can be extremely useful). You can also expect a subwoofer audio output, with a separate control and full video playback. This system also comes with a multifunctional system that includes a GPS Navigation system, DVD CD receiver, and Bluetooth for all those hands-free calls and audio streaming. Users cannot go wrong with the dual compatibility for both Android and IOS software; even though your primary phone may be an Android, having the option to adapt to IOS software is certainly a plus. Installation is also incredibly easy with this particular model. This model is cheaper than the first system that we discussed (coming in at $229.99 on Amazon) and, naturally, we always get what we pay for so with this being said, the instructions on how to navigate the stereo system once its installed are a bit on the weak side. The Pioneer AVH-X4800BS comes with both a DVD and CD receiver, with Bluetooth for hands-free calling, as well as audio streaming. It is also equipped with a built-in iPod, iPhone, and iPad control which is an additional option if the user requires something to view video content. Lastly, the Pioneer AVH-X4800BS works with Sirius XM (Sxv300 tuner) and supports all of the latest music, traffic & weather now, in addition to sports flash features (for all of the athletes and sports lovers out there). Naturally, the pros and cons will vary depending on if you are an iPhone or Android user, however, for the purposes of this review, we will focus on those who are Android users. The Bluetooth capability works incredibly well; if you decide to install a backup camera, as well, there has been an incredible review about that camera also. The price of this component is also pretty reasonable; coming in at $288.00 on Amazon (this may be a bit cheaper if you are an Amazon Prime user). The cons surrounding this stereo greatly depend on your particular vehicle and what it is, exactly, that you are looking for in a stereo system. Depending on your car (and if you install the system itself), you may have to cut out some of the surrounding material from the original radio system that came with the vehicle, and this may, or may, not cause you some difficulty. 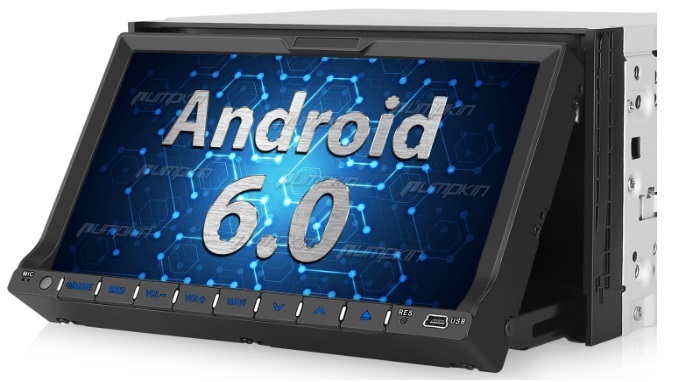 The Android 6.0 Marshmallow Car Stereo (who doesn’t love that name), has a 2GB RAM and 32GB ROM, which has a larger internal storage than most other brands on the market and is extremely beneficial; this allows for faster installation of applications, not to mention the CPU Intel SOFIA 3GR Quad Core, 7 inch HD Resolution multi-point capacity touchscreen and support that also comes with this particular stereo system. The Android 6.0 Marshmallow also has a built-in Wi-Fi module that allows for easy connections and availability to hotspots for surfing the Internet. The Android Marshmallow comes, like many others, with hands-free Bluetooth capability, Sleep mode, Google play store (just in case there are some games you need to download on-the-go), steering wheel control, backup camera, customization for light colors, and a host of other add-ons that any user would go bananas over; price is also a nice pro, with this system starting at $293.00 on Amazon. There have been some reports that the size of the device does not fit their car, in addition to there being some reviews of the installation being incredibly time-consuming and difficult. Users have also stated that they experienced issues with their Google play being able to connect once the installation was complete; also, as of now, this stereo is not compatible with other software (i.e. IOS). 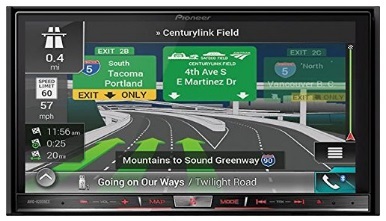 This particular Android car stereo weighs almost 9 pounds and is equipped with touchscreen and microphone access, coming in at about $270.00 on Amazon. These systems allow the user to stream music, make phone calls, and have availability to a competent GPS system (which can be a lifesaver for most of us). Those who decide to purchase this model also can expect touchscreen functionality, access to Google Play Store, as well as Google Maps – Wi-Fi connectivity (when available), and a motorized fold-down adjustable display for convenience and because it’s pretty cool to look at. The installation of this system is fairly simple, albeit longer for those who may be a tad short on patience; the Wi-Fi works incredibly well for streaming music and apps. The factory brackets may or may not fit well during installation so you may have to purchase your own, depending on your vehicle. Some users may think that the system runs on the older version of Android but, generally, the apps work just fine. An overall review of the products listed above comes to this- be sure to determine what stereo system fits best for what you are looking to have in your car (sound, Wi-Fi, capability, etc), as well as what fits your budget. On a more surface level view of things, be sure to measure your original radio stock properly to ensure that you purchase a new stereo system of the correct size so you will not waste time or additional money having to install the new product (this can be a headache within itself). Happy listening! I ordered this as an upgrade to my old Bluetooth single din stereo. It was a little tricky to connect the way I wanted to use the backup camera as it was not as it was designed for, but for most people, it is pretty straightforward to install. I am actually using my camera on the front of my Jeep to assist me with approach angles while off-roading. (I bought the camera separate as the unit doesn’t come with one) Love the navigation and the Bluetooth connectivity to my iPhone. Only thing I don’t care for is that it doesn’t recognize my iPhone when I connect it to the USB connections as my old pioneer deck did, but I can get used to it. It comes with a bunch of apps installed, although to use them I’d have to run my iPhone hotspot wi-fi to connect to the internet or be at home with a connection to my home wifi. I have used the iGo navigation app which has spoken and visual instructions to help you navigate to your destination… very cool to have, and “she” talks even while I’m listening to the stereo to get me where I’m going. Definitely a nice upgrade from my old unit!